Prime Minister Ehud Olmert, in an unprecedented public acknowledgment, called continued Israeli construction in West Bank settlements a breach of Israel's obligations under a recently revived peace plan. The remarks, published Friday in The Jerusalem Post daily, came just days before President Bush arrives in the region to build on the momentum created at a Mideast peace conference in Annapolis, Md. Bush, in a separate interview, urged Israel to uphold its commitment to remove the settlement outposts in the West Bank. "The Israeli government announced that it plans to get rid of the unauthorized outposts, and that's what we expect them to do. We expect the Israeli government to honor its commitments," Bush told the daily Yediot Ahronot in the interview, published Friday in Hebrew. Israel has long maintained it has the right to continue building in existing settlements to account for "natural growth" of the existing population - something the peace plan explicitly bans. But Olmert acknowledged that Israel was not honoring its commitments - a significant development because Israel has never before admitted it was violating the internationally backed "road map" peace plan. "There is a certain contradiction in this between what we're actually seeing and what we ourselves promised," Olmert said. "Obligations are not only to be demanded of others, but they must also be honored by ourselves. So there is a certain problem here," he was quoted as saying. The comments build on Olmert's recent efforts to defuse friction over construction in disputed territories. Construction plans announced after the Annapolis conference have antagonized the Palestinians and disrupted fledgling peace talks, renewed after seven years of simmering violence. Olmert added, however, that Israel believes a Bush letter to the Israeli government in 2004 "renders flexible to a degree what is written in the road map." In that letter, Bush wrote that "existing Israeli population centers" should be taken into consideration when the final borders of a Palestinian state are drawn. Israel interprets this to mean it can hold on to major West Bank settlement blocs, where the majority of its 270,000 settlers live, and where much of the contentious construction is going on. Palestinian negotiator Saeb Erekat welcomed Olmert's remarks. When both sides admit they are not carrying out their pledges, that "should be the way for both of us to carry out our obligations," Erekat said. The two sides have agreed that the foundation for any accord would be the road map, which was to have led to the establishment of a Palestinian state by 2005, but languished shortly after it was presented in 2003 because neither side met initial obligations. Under the first of the plan's three phases, Israel was to have halted West Bank settlement construction and the Palestinians were to have clamped down on militants. Settlement construction has been a key obstacle to past peace talks. After recent construction plans announced by lower-level bureaucrats stymied the renewed negotiations, Olmert ordered last week that all new construction receive his approval. He did not, however, halt construction that was in progress. Meanwhile, an Olmert confidant said Israel might soon begin dismantling some of the more than 100 unauthorized outposts settlers have erected - another peace plan obligation. "I hope and also believe that in the near future, during the U.S. president's visit to Israel and afterwards, real steps will be taken to remove those outposts," Vice Premier Haim Ramon told Israel Radio. Settlers have set up the outposts - mostly small encampments - in an effort to break up territory Palestinians claim for a future state. The road map obliges Israel to take down about two dozen erected after Ariel Sharon became prime minister in 2001. Palestinians claim all of the West Bank, east Jerusalem and the Gaza Strip for their future state. Israel captured all three territories in the 1967 Mideast war. It immediately annexed east Jerusalem but left Gaza in 2005 after a 38-year occupation. Israel has stepped up efforts to make peace with the moderate Palestinian president, Mahmoud Abbas, ever since the Islamic Hamas routed Abbas' Fatah forces and took over Gaza in June. At Annapolis, both sides set a December 2008 target - the end of Bush's tenure - for reaching a final deal. 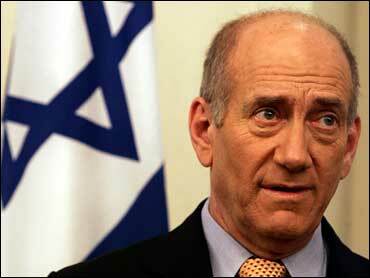 Olmert told The Jerusalem Post that a peace agreement might not be reached this year as Bush hopes. But Bush has not applied any pressure on Israel to advance in the negotiations, Olmert said. With both sides aiming to work out a final peace deal by the end of the year, Israel has demanded that Abbas crack down on militants, while carrying out its own operations against extremists in the West Bank and Gaza. Abbas has introduced a security plan for the West Bank, but has no influence in Gaza. Two Hamas gunmen were shot and killed by Israeli troops along Gaza's border with Israel before dawn Friday. That brought to 11 the number of Palestinians killed since Thursday, when militants struck a major Israeli town with a more powerful rocket than they usually fire. Four of the 11 Gazans killed were civilians. A rocket fired Friday from Gaza damaged a house in the southern Israeli town of Sderot, but no injuries were immediately reported.